The Blue Yonder is a travel company, but each experience we design is strongly rooted in an initiative aimed at fixing a social conundrum. We aim at reviving, preserving and encouraging the continued sustenance of a destination’s age-old heritage. The only way to ensure the authenticity of a destination is to ensure the active participation and empowerment of local stakeholders. Our many initiatives are aimed at empowering local communities with an alternate source of income and generating a sense of pride amongst them through the appreciation of our travelers. The project started in December 2003 when we felt the need to intervene in the deteriorating condition of the Bharatapuzha, (River Nila) in Kerala, India. What was once the life line of Kerala is today a decaying, depleting river. It is out of concern for River Nila, the erosion of the river banks, the dilution of its culture, neglect and dimishing of its resources, that the initiative was started. We wanted to provide a common platform for those who are concerned about rivers in general and River Nila in particular. As part of the initiative we networked with various musicians, folklorists, ritualists and craftspersons in the locality to document rare rituals, art forms, handicrafts and bring in a sustainable income. This initiative alone has won more than 15 national and international recognitions. This was started in 2006 with the idea of bringing attention to the musicians of Mulayankaavu near Angadipuram in Kerala. Due to various caste practices, these musicians were side-lined. In partnership with Njaralathu Hari Govindan, we set up an initiative called Musical trail that showcases the musical tradition on the banks of River Nila. The initiative received a lot of attention from national and international media and travellers. Renowned publications like Deccan Herald, The Hindu, Outlook Travellers, Outlook Business, The Guardian (UK), BBC World, Conde Nast Traveller featured these musicians for the first time. Since we launched this initiative, they have a social status and opportunities for more work. This experiment led to Hari Govindan launching a permanent campus for music as a memorial for his father who revived Sopana Sangeetham, classical Indian music developed in the temples of Kerala. 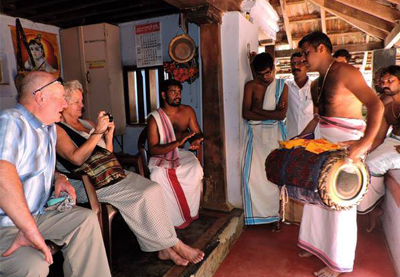 Music is now taught to people from all castes and religions in this camp and is a regular stop for TBY travellers. The initiative is currently providing a platform for more than 150 students (boys and girls) to learn music regularly. 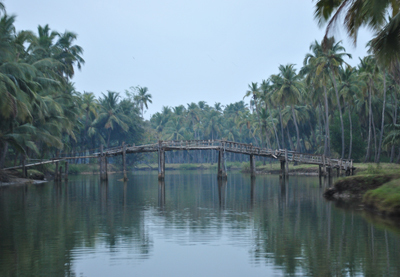 Seeing the success of the initiative, the Kerala Tourism Minister announced INR 2 million for the project in July 2012. This initiative was the highlight of a national TV program called ‘Dewarists’, where our team members performed with musicians like Karsh Kale and co-created the music production called ‘Sacred Science’. Musical trail is now designed and promoted in other locations in keeping with the local flavour, including in places like Pondicherry. The initiative is self-sustaining with almost no intervention from our side other than engaging our travellers with the musicians. More than 250 locals, including students and hundreds of musicians from the region, benefit from this initiative. Initiated on a small scale in Kerala to highlight the importance of planting trees, we always request all our travellers to plant along with us during their visits to River Nila. Many times the initiative has failed as we found it difficult to get care for the plants in public places. Now restricted to a few properties, where our guests stay as well as private land owned by some of our interpreters, these are used to develop the forestry program. 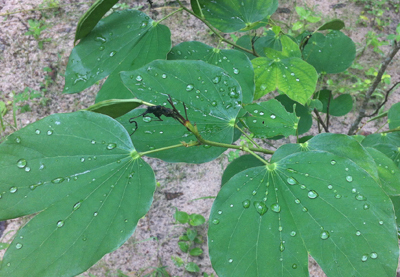 We are currently developing nurseries in Pondicherry and on the outskirts of Auroville to set up Travellers' Forest, as yearlong planting isn't possible in the weather. 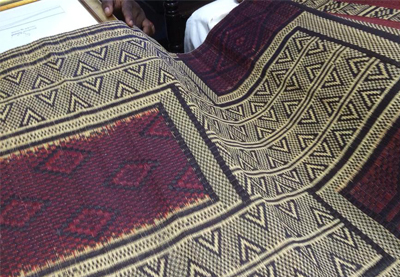 We are involved in reviving Killimangalam mats, a unique variety of hand crafted mats recognised by UNESCO with its crafts seal but struggling to provide even INR 100 per day to those involved in the production. Currently there's only one person involved in the craft production and we have taken up the mentoring of the unit. We provide grants worth INR 400,000 a year to support the initiative into developing as a sustainable business model. Travellers get to visit the workshop, take lessons and can place order for unique mats to take home as souvenirs. 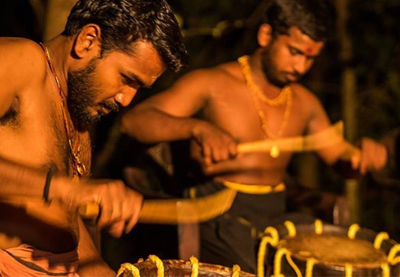 Mudiyettu is a ritualistic dance drama that has been declared by UNESCO as an 'intangible heritage of humanity'. However, like many other struggling performing arts and rituals in India, this art form is also practised by only a handful of people/families. 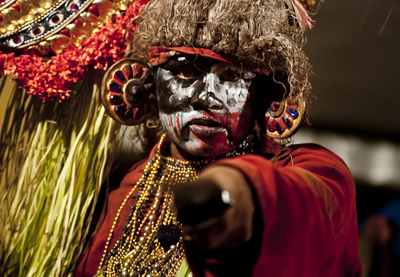 Varanath Asan is one of the most reputed living performers of MudiyettU, a ritualistic art form from Kerala dating back more than a 1000 years. We are publishing a book by Varanath Asan and supporting his school through small grants. Travellers can visit the school and have interactive lecture demonstrations. We work in partnership with Ground Truth Initiative to crowd-source the cultural history of Nila. Our task is to understand the wealth of cultural activity and history in the Nila basin, much of it very place-specific, and devise a methodology and training for turning this into an engaging multi-input platform for showing off the local riches- all this with a view toward drawing out elements for the tourist to seek out and enjoy, giving locals a chance to celebrate their heritage, while providing a means for preserving not only some of the more fragile customs and artistry of the area, but also the very river itself. Travellers can join our mapping parties and help us document the richness of the region on OSM. It is a voluntary initiative from students who worked as community based palliative care volunteers. This campaign is focused on volunteering and intervening in many social issues across Kerala. This isn't an initiative we founded, but are supporting as they are part of the journey to create a compassionate society. The latest project where we collaborated was to harvest Pokkali, when students volunteered after they came to know that there was a shortage of labourers and that there were chances of losing the entire crop for the season. Close to 300 volunteers travelled for five hours in buses and reached the Pokkali farms and stayed in the local villagers’ homes while they helped the farmers to complete the harvest. This is a yet to be launched project connected with Story Tellers Network and Open Street Mapping initiatives. Locals nominate a champion from Pondicherry, or from their locality, usually an individual who is making a transformational change in the society It could be a traffic police woman who helps the community or it could be a district collector bringing in transformational change in the society. This is TGT's way to celebrate local champions. They will be lauded through public functions, honorariums, fellowships and more. 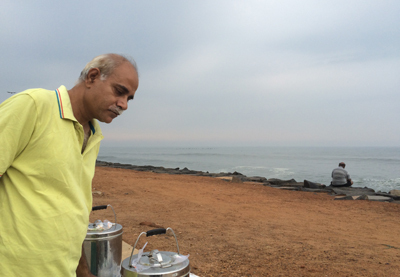 Travellers get an opportunity to meet them at home or visit their sphere of work during their travels in Pondicherry. 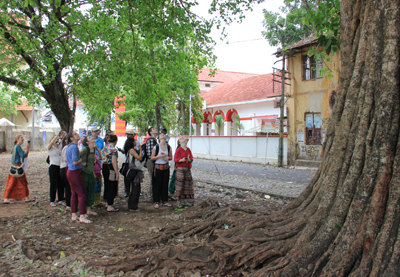 Initiatives are functioning informally in rural Kerala and Pondicherry and are assisting our travellers in multiple travel experiences including Pokkali and Heritage Walks. There's a story behind how an Aurovillian product became a mentoring project of The Blue Yonder. Gopirajan, one of our colleagues and the initiator of Payanam, introduced us to Bendi and its current undertaker, Ramesh. 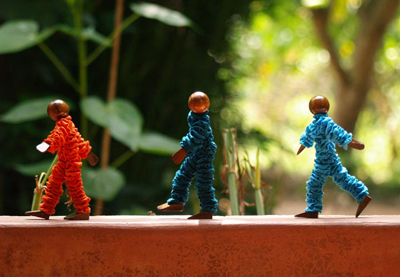 A brilliant idea and design handed over to Ramesh by a Frenchman, Laurent, who left Auroville. We are currently micro-funding the unit and providing business opportunities for the workers associated with the centre within Auroville. We are involved in reviving Pokkali, a red coloured rice which has a rare tolerance to salinity. A unique partnership we facilitated between local students, farmers, community members, cooperative bank and a local Panchayat has resulted in farming more than 50 tonnes of rice in a place where most of the paddy used to be left behind in the field due to lack of labourers as well as lack of demand. Inspired by the success of the initiative, the nearby Panchayat has joined us to develop a similar model for sustainable tourism in the region while promoting development of the region. 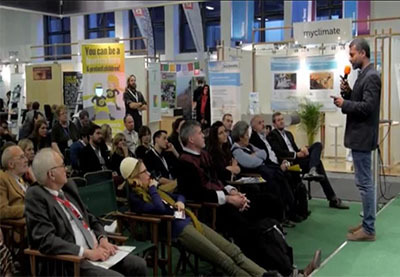 World Food and Travel Summit lauded this initiative as a Climate Change Resistant Food initiative in 2013. 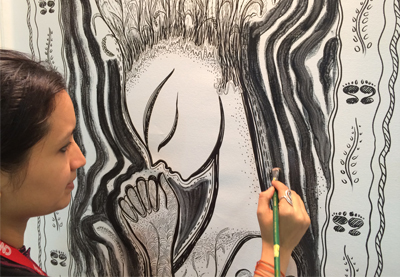 The Blue Yonder worked with Singaporean artist Sarbani Bhattacharya during the ITB-Asia 2014 to present the story of Pokkali. 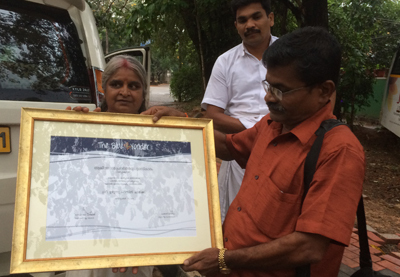 Sarbani was touched by the #BecauseICare campaign, a ‘Students in Palliative Care’ initiative based in Calicut. The group intervened to harvest the rice along with the farmers when they learnt of the agrarian crisis where the entire harvest would have gone waste otherwise. To celebrate this partnership between communities, Sarbani came forward to sketch live at ITB-Asia 2014 for three days and the work in progress of this 'Story of a Rice' is visible in this album. The Blue Yonder Life Time Achievement Awards for INR 100,000, Fellowships worth INR 120,000 and Scholarships for INR 30000 were announced on the UN World Tourism Day in 2014 to celebrate those people who are reviving a unique heritage under extreme constraints. The first award went to Chami Master for his contribution to preserve the heritage and Prabhavati Amma for her contributions to sustain the only remaining unit. Sarath from Vayali folklore group also won an annual scholarship for being the first student to have registered for the learning course. At the World Travel Market London 2007, some of us got together under the initiative of The Blue Yonder and Tripbod to bring together those interested in Responsible Tourism. Since then, a fringe event in a London pub has grown into an annual event at some of the world's largest travel shows like ITB-Berlin. RTN has grown into a place where innovative initiatives find their market and where the market sources content. Networking is fun, and it's also good business. RN has become a global network of travel innovators and enthusiasts working to "create better places for people to live and for people to visit." We host on and offline networking events across the world during important travel and tourism trade shows so that interaction with mainstream industry is possible. Networking events have occurred in London, Berlin, Singapore, Oslo, Kathmandu, Delhi, Goa and Durban, amongst other places. A to Z of Responsible Tourism is a crowd-sourced campaign to promote and demystify responsible travel across the world. This campaign is designed to collate stories, values and experiences that will help promote Responsible Tourism. Despite efforts in the last two decades, Responsible Travel is still niche and small. Many businesses as well as travellers are yet to embrace this idea. A-Z of Responsible Tourism was designed by TBYA, the consulting arm of The Blue Yonder, as part of its initiative to articulate the concept of Responsible Travel. Conceptualised by Zainab Kakal, the initial sketches were created for the exhibition space of The Blue Yonder at India's first Biennale at The Kochi Muziris Biennale 2012 by two design students Akshan Ish and Sudeepti Tucker from the National Institute of Design, Ahmedabad, India. The second phase of the backdrop was donefor an interactive installation at ITB Berlin 2013, completed by Ameya Kulkarni. These were later converted into separate post cards by Binit Basa of Triature with text from Zainab and Jeremy Smith. These cards were used at ITB Berlin to interpret the backdrop on the theme of Responsible Tourism to trade visitors and consumers by Mariska van Gaalen. The campaign won the prestigious Das Goldene Stadttor 2013 in Berlin. We all want to help fellow human beings in distress. This becomes an emotional engagement especially when we are connected to the people and places. Nepal is a soft-power in the sense of the connection it instills in people. When the Earth Quake hit Nepal in April 2015, we reached out to our colleagues and partners in Nepal. Like many others, they were reeling under immense shock and we chocked few plans on how to help from a distance. Seeing the eagerness all over the world to help without sensing the ground realities, we put together this note on what one can and shouldn't be doing. We have been involved in Open Street Mapping for last two years and know the power of crowd-sourced information. 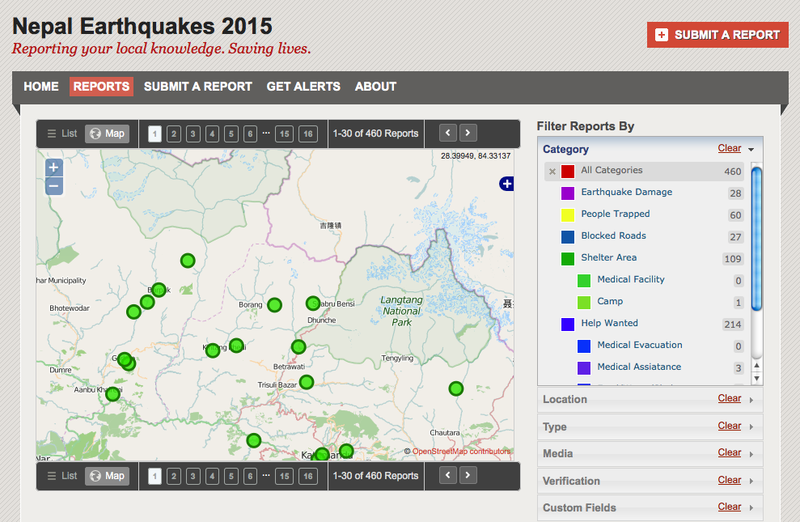 We sent out another manual as a step step by instructions on how to help Nepal through mapping from a distance. We are partnering with Ground Truth Initiative, Mapbox Bangalore to support Kathmandu Living Labs and rest of volunteers at Humanitarian Open Street Map team. Check for updates on our blog to see how mapping initiative is helping volunteers, disaster managers and government agencies to work efficiently.